My name is Hedwig Wiebes. 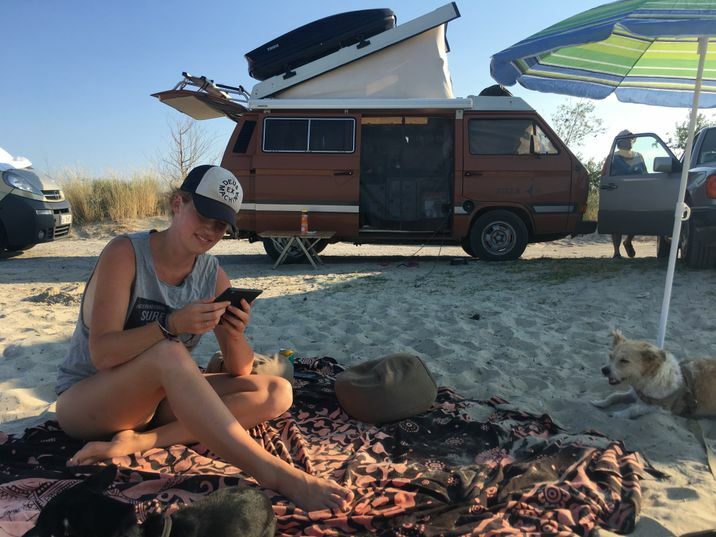 I’m 32 years old, from The Netherlands and as of October 2016 I swapped my house in Amsterdam for living in a van, together with my boyfriend Jeroen and our two dogs Tommie and Olaf. This is the most important reason why I got an eReader: because it would be impractical to have all of my books with me. I must admit: I wasn't an early adopter of digital reading. I love books, and next to the beautiful stories and wisdom they contain, I also love the way they feel, look and smell. It just seems so much more romantic. I even worked in a bookstore for a few years. But yeah, for living on the road I had to wave goodbye to my filled-up shelves and night-stand piles. My boyfriend already owned an eReader, and gave me one as well: the Kobo Aura H2O. Hesitantly I uploaded some titles onto it. I still remember the first one I read: The Grapes of Wrath by John Steinbeck. Immediately I welcomed the lightweight device in my hands. It was slim and different from a hefty thick book. No paper, but something much more convenient altogether. Something I quickly started making use of was the built-in dictionary. When I read in English instead of Dutch, there are always words that I don’t know. The feature helps me understand what the writer means, and as a bonus I get to extend my vocabulary. I also appreciate the ‘night screen’ option, and it's something I use a lot. More than half of my reading is done at night, and it's convenient that I don't need a bed lamp. The only thing I didn't (and still haven't) tried is the waterproof feature. I trust that it works! In general, I’ve gotten very attached to my eReader in a short time. I appreciate the possibility of being able to read practically every book whenever and wherever I want. Especially now, as I travel and roam around countries where there are sometimes not even English books to be found, let alone Dutch. It makes me laugh when I think back of one vacation where I dragged six books along in my luggage, while Jeroen had an unlimited digital library. To say I was jealous was an understatement. I’ve always liked reading but there have been many times when I was ashamed of how few books I finish. However, since using my Kobo I read so much more. I don’t know whether it’s the percentage at the bottom that keeps track of my reading or that I can easily see the books waiting for me, but it encourages me to go on. What I do know is that I enjoy using my eReader and I started doing so almost immediately. This totally surprised me – and I’m happy it did. Want to follow Hedwig on her adventures? 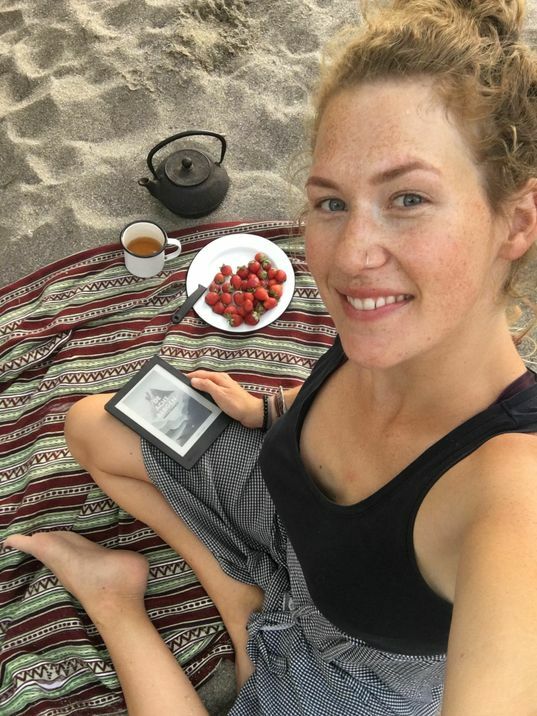 Check out her Instagram @hedwigwiebes or website: liveslowdriveslower.com. For similar content, read Living with Books in a 31’ 1977 Airstream Land Yacht.